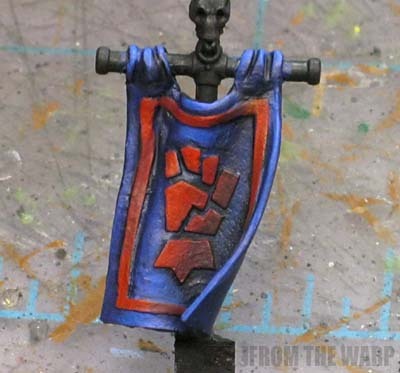 I'm a huge fan of banners and the character they bring to an army. For the longest time, I've been trying to work out how exactly I can make them with the detail I want and give them that flowing look and add movement to them. I think I've got it now. My first attempts (and fairly successful at that) were to make them from cardstock and paper. The cardstock providing the sturdiness and body of the banner while the paper image glued on top gave me the detail. The only trouble was, they were always flat. Trying to bend them did not work and ended up partially destroying the banner. If you wanted flat banners, this was perfect, if you wanted the flowing kind... it wasn't going to work. 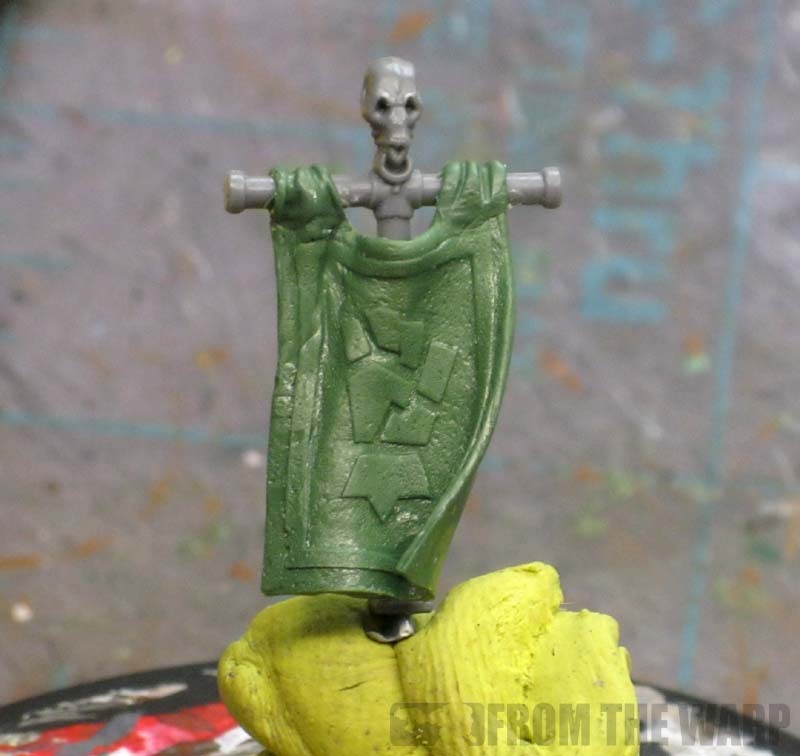 Then I started building the banners out of greenstuff and shaping them into the flowing positions I wanted. This was a partial solution since it got me the organic shape I wanted, but I was left having to freehand all of the artwork on there. That can be tough depending on how complex an image you wanted on the banner. Then I saw something that sparked this idea. 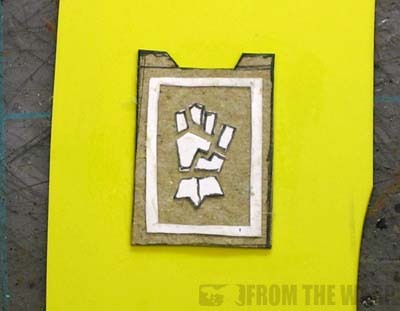 I figured I could sculpt my "banner" flat and add the imagery in low-relief with thin cardstock and go from there. It would be the best of both worlds. Turns out I might be onto something here. Yep, I built the banner flat to include all the image detail, made a simple press mold of the banner and then cast it in greenstuff. The process is fairly straightforward, but there are a few things I'm still ironing out. My first attempt here is a rough one at best. I really just wanted to see if it was doable at all. I started by grabbing an actual banner for size comparison. I had a additional spare banner pole in my bits box I planned to use to mount my greenstuff banner onto instead of building a pole from scratch so I made my test one to fit it. No sense in adding more work. I made my blank from cereal box cardboard. You could make it from any kind of plasticard or cardstock that is the right thickness. I did not make long tabs at the top of the banner to drape over the horizontal cross bar because I didn't want the bulk up there. I figured I'd add them later on and add the folds as I needed to. In this case, I went with a simple image to see how the detail would translate. Like I said, this was a test. Working in low-relief has it's considerations, but I just wanted to make sure this would work first of all. I decided on a Crimson Fist symbol and some trim around the edge. Once I had my banner complete, I glued it down to a piece of plasticard to serve as a backing for when I made my press mold. I took a blob of Blu-Stuff and made a one piece mold of the banner while it was flat. Giving it enough time to cure, I mixed up some greenstuff and laid out a smooth layer of it in the mold making sure I had a consistent thickness for the whole banner. I left the greenstuff in the mold for about 35 minutes before pulling it out. This gave it time to partially cure and still be flexible enough to manipulate without leaving a ton of fingerprints all over it. This was the hardest part. I think I may leave the next one in the mold slightly longer for some more stability, but the idea is there. You take out the greenstuff banner, position it how you want it to flow so it's movement matches with the movement on your model and let it cure completely. Once it cures, you trim away the excess flash and glue it in place under the horizontal crossbar on the banner pole. Taking a little bit of greenstuff, you carefully sculpt your two attachment points and let it cure for good. This one is rough, no doubt about it. But it works. The idea is there and I'm going to try it with something much more complex next time to see how it really holds up. Something like a chapter banner. Thats very nice and helpful. I might however be inclined to use thin plasticard instead of the cardstock, as it looks like the mold picked up quite a bit of texture from the fibrous paper surface. :O that's Sweet! thanks, I'll have to give it a go. Mate bloody brilliant! Will be doing that down the track for sure! I think you just "leveled-up" a few hobbyists. Fantastic! I'm still partial to the flat surface banners personally, but this is a great addition to the already amazing 'making banners' series you have going here. Well done! I'm thinking about a Bran Redmaw's banner. Once again you surprise us all with your ideas! Will put this in the very long queue of your ideas I want to try out! Wow, that is an awesome technique! I used a similar idea to do the large scroll/banner things on the back of the Ecclesiarch -- just didn't take it quite as far with the surface detail. You also now have a master to replicate it for vehicles, etc. Fantastic, yet another amazing tutorial you've put together Ron. 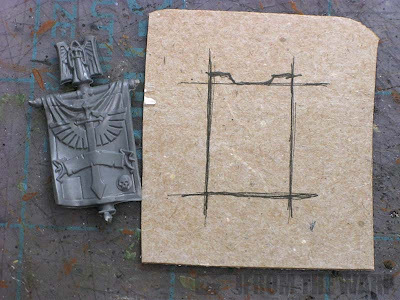 The Red Corsair army I was given recently has a very similar set up for casting SM shoulder pad icons. I wasn't really sure how to do that however (usually I call GS my enemy). So this is rather helpful, thanks! Holy cow, I'm glad you guys like this one! Yes, the mold does pick up some surface texture of whatever you use to build your master with so be careful there. 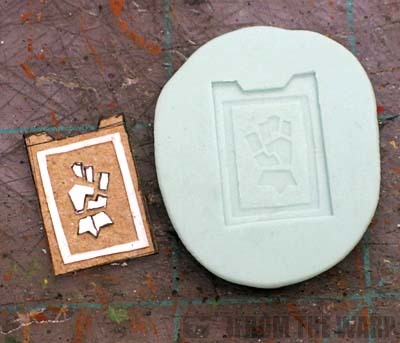 You might seal the master with a thin, diluted layer of PVA (white) glue before making a mold of it so it holds up. Anyone have any suggestions for a chapter banner that might be a good challenge to really push this concept? I want to do a big one to see how practical something like this really is in capturing fine details. This looks really good and simple too. Thanks Ron. You are a bloody genius! This is so gonna be used for my Ironwolf Company Banner! I've been experimenting with using sculpey to make molds of bits I want to reproduce - I'm very happy with how it let me steal Gabriel Seth's awesome halo but not his silly wings, and how it helped fill the gaps on the tank-scale multi-melta I attached to a dreadnought - but I haven't tried blu-stuff yet. If this is what it lets me do, I'll have to give it a shot. This looks awesome. That is really cool, Ron! Man, I need to get a hold of some blustuff and give that a go. Keep up the great work, these tutorials are incredibly useful! Nice .. I was thinking about how I was going to make banners for my custom chapter and this is perfect timing 8) .. Blu Stuff rocks! Thanks for the info..
Spray a quick layer of gloss sealer over your template before you make the mold. You use a gloss sealer prior to decals to get that perfectly smooth surface. The same would apply here. Impressing alchemy you've got there! I must now plunder, errh, acquire some of that blue matter that you mention. What about Space Wolf company symbols? They're basic but they have details. Might be interesting to see how those comu out, as you've used an old-school banner pole. I'd love to try doing Ragnar Blackmane's banner like that. Definitely giving me food for thought. Ragnar's banner is below for those who aren't familiar with it. AoM: A quick spray with a gloss sealer. Excellent idea! Excellent idea. So simple yet effective. Thanks for the heads up and tutorial! I imagine this will help all those lesser supported / DIY chapters out there. Ron, I'd love to see a raven guard chapter banner, something akin to the ultramarines chapter banner. It would be very difficult. Impressive! Can't wait to put this into production. Fantastic Work as always Ron! Please make a Space Wolves banner using Ragnar's icon. I have tried a few times and always failed. Interesting, even though I'm not exactly a fan of three dimensional banners. I wonder whether my wife's craft plotter could automate cutting shapes, small as they are. Friggin amazing... wth haven't I thought of this. I ned to get some of that Blu-Stuff to play with. Thanks for the inspiration Ron! Can't wait to see your next go-round! I am going to try my hand at the Dark Angels Chapter banner. It has a crazy amount of detail on it and could certainly break my resolve to pull this off. Results to be posted when I do finally get it done. Don't look for it soon though. There's a lot out cut out there. Awesome, I like the texture differences. Baldsmug: They can be a bit (read: tons) time consuming to build, but painting the textured surface is a breeze and the ability to add that flowing look is what I'm really shooting for. Since fingerprints might be an annoyance in non-cured green stuff... why not wear some surgical gloves? Might help solve the issue and give you more ability to shape without leaving marks?? oink: Fingerprints can be dealt with very easily using a clay shaper. I don't know if trying to do this with gloves would make it easier or harder. And most surgical type gloves have some very slight surface texture ion order to improve grip. I think the big thing is being patient enough to let the gs cure enough to hold it's shape and be less prone to picking up fingerprints. Anon: You're welcome, thanks for stopping by!